I’ve just returned home from my most recent adventure, to the land of the midnight sun* in arctic Norway. I’m still editing pictures, but wanted to be able to share a few images from the trip. There are many more to come. We had fantastic weather, and saw a wide variety of wildlife. 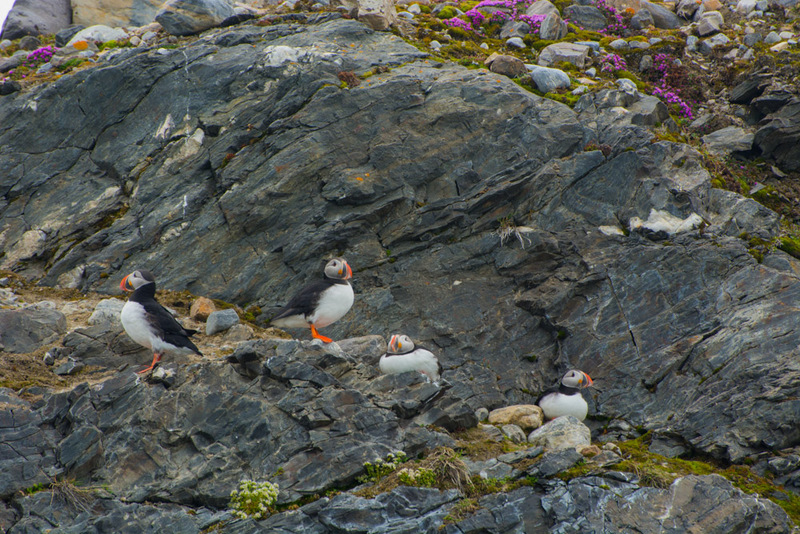 We saw quite a lot of birds, but everyone’s favorite is always the puffin. I’d seen them before in Iceland, but I never really knew the way they hop around on these cliffs — it’s as if they don’t quite know how to walk, so just improvise something to get some forward locomotion. It’s adorable. 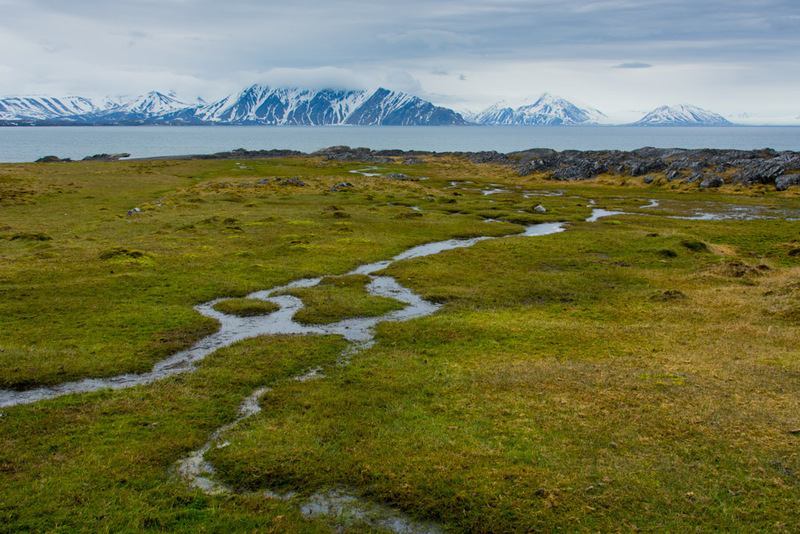 Rich tundra at Varsolbukta, Bellsund, Svalbard, Norway. The tundra here at Vardsolbukta was incredibly rich and varied – several species of tiny flowering plants, mosses of a half a different shades of green, various lichens and such. The ground in places was like walking on pillows, the moss was so soft. It felt really strange. Things take forever to decompose in the arctic, so there are all sorts of bones and reindeer antlers, skeins of shed reindeer fur and various feathers lying around to be studied. It’s the kind of place you want to walk around bent over at the waist so you don’t miss anything. 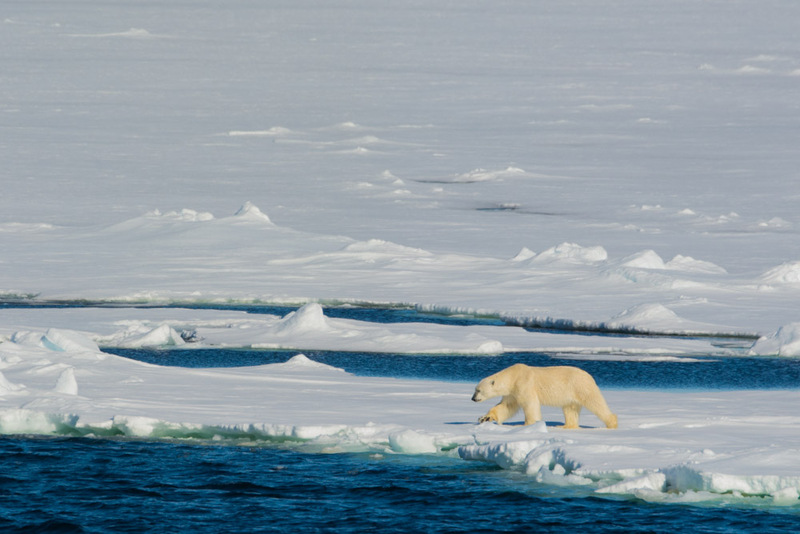 Polar bear on the pack ice in the Hinlopen Strait, Svalbard, Norway. And of course: a polar bear! The trip would not have been complete without one…. in the end we saw seven, a very unusual number. This one was particularly photogenic in the bright sunshine and sporting a healthy sleek coat. There really is something incredibly special about seeing a huge predator like this in the wild. There is that little chest-tightening frisson of excitement the moment you spot it: ” *gasp* BEAR!” — even more exciting if the bridge has not announced its presence yet. There are many more images to come, including some surprises — things I never would have expected to see on a trip like this. *A note on the “midnight sun” — I’ve never really experienced this before. What it really is could best be described as: “noon all the time” — there is essentially no modulation in the strength of the sun at any time of day. If the sun is out its at the same height in the sky all the time. Most disconcerting. Bring an eye mask. A good one.